We are very proud and grateful to offer the following essay, A Phenomenological Study into the Experiences of a Flute Maker/Player Dyad, which was completed by Elizabeth Petcu in May of 2002 as a final semester essay that she undertook to gain her Masters Degree in Music Therapy from the University of Limerick. 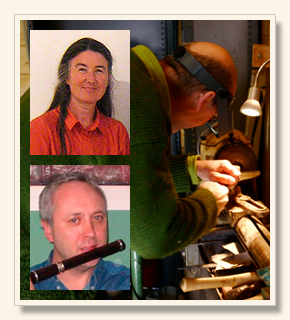 The flute maker/player dyad* that Elizabeth chose to observe as the subject for this study was made up of Martin Doyle (flute maker) and Desi Wilkinson (flute player). Elizabeth Petcu is herself a distinguished flute player who held the position of Principal Flute with the Radio Telefís Éireann Concert Orchestra for over 25 years. She has recently released a solo flute music album, Just Me, and is the director of the three piece music ensemble Rune which includes Martin Doyle. As well as being a good friend and a ceaseless source of encouragement to Martin over the years (they were neighbours in their native township of Bray in County Wicklow), Elizabeth plays Martin's Irish flutes and has one of his wooden headjoints for her Muramatsu concert flute. * Dyad : pair : specifically : two individuals (such as a husband and wife or two close friends) maintaining a sociologically significant relationship. This study is an attempt to shed some light on the experiences of a flute maker/player dyad. The flute maker and the player were interviewed separately before the instrument was completed. A phenomenological approach was used to distil the essences from the interview transcriptions. The opportunity for feedback from the participants was included in the design. Themes which emerged from both interviews are presented and discussed, and summarised in the final section. Discovering a flute maker's workshop in my local town a few years ago enabled me to combine my lifelong fascination for woodwork and wood turning with my love of flutes and flute playing. Under the allure of the atmosphere in the workshop and listening to the philosophising of the maker, caused me to be curious about the 'ingredients' contained in the instruments. I wondered if the experiences of the maker, as he worked, could be converted into a more tangible form. The phenomenological approach, also recently discovered, suggested itself as being a possible way to reveal the powerful, unspoken psychological processes and energies which I could palpably feel in the workshop. If I could sense these energies, I wondered whether the player might also be aware of them in some way. As Bruscia points out, the purpose of qualitative research is to bring the unconscious to consciousness Bruscia (1996). This was one of the reasons why I felt that a phenomenological approach would suit the information I felt might emerge. Benezon believes that an instrument maker who is aware of his own sound identity may make instruments well adapted to his intended player's creativity Benezon (1997). This statement could be an attempt to include the less tangible ingredients which might be contained in the instrument. He goes on to acknowledge that three individuals are needed for music making: the instrument maker, the player and the listener. I decided to pursue these ideas through observing the coming to life of one of the most special flutes in the workshop at the time. This instrument was to be a silver-keyed, simple system, cocus wood flute. Exploiting the idea that qualitative inquiry uses purposive sampling enabled me to choose participants I felt most likely to serve as the best informants for this particular study Amir (1996a). The designated player offered me much thought-provoking material in his interview. Kenny (1996) identifies the aims of research to be: to learn, to understand, to improve, to change and to grow. These aims could also be considered to form a large part of the preoccupations of instrument makers and players. By choosing the word 'dyad', which I heard for the first time in a music therapy context, I thought that I might perhaps discover links between the therapeutic process and the process of instrument making and playing. Learning through self-discovery is emphasised by Forinash & Gonzales (1989). They declare that attempts to make knowledge impersonal in our culture have split science from humanity. In empathy, while maintaining one's own position as researcher, one gradually allows oneself to feel one's way into the other's experience Churchill, et al, (1998). Parallels can be found in existential therapy, which can be seen as a collaborative adventure in which both client and therapist will be transformed if they allow themselves to be touched by life Corey (2001). Also shared by phenomenological research and existential therapy is the use of the self. Bruscia (1996) advises that researchers may need to be aware of any counter transference issues which might influence their work. To prevent any unhelpful counter transference issues arising, I have honestly declared my stance in an attempt to create an awareness of this possibility both for my own sake and for the sake of the reader. As the condensation which forms on the inside of a flute after playing could be considered the distilled essence of the flute player, so phenomenology may be thought of as the study of essences Merleau-Ponty (1962). Growing out of the philosophical schools of Heidegger, Husserl and Sartre in the early twentieth century, phenomenology is a research method which allows the researcher to distil experience as it is lived. As announced by Husserl in 1900, phenomenology was a radical way of doing philosophy. It was conceived to bring philosophy back from abstract metaphysical speculation and into contact with concrete living experience Moran (2000). Rather than being a search for the truth, phenomenology aims to provide meaning and relevance for experiences, simply because they exist Forinash (1995). A phenomenologist tries to understand a thing on its own terms – resisting interpretation Ansdell (1995). Sartre believed that knowledge may represent a multiplicity of perspectives and not a unified, single truth (Moran, 2000). He argued that anything perceived is perceived by someone and that perception is directly related to the perceiver. Kenny takes this idea a step further when she allows for multiple perspectives within the one person's perception. Although I define, I am, as well, repelled by definitions, attempting to embed ambiguity, leaving room for life. Qualitative research (phenomenology, in this case) allows for ambiguity, it respects the uncertain Amir (1996b). The importance of the perceiver is also acknowledged by Husserl when he spoke about reflection time, the depth of response accessed by the researcher through the time allowed for reflection. The word phenomenon in the Oxford English Dictionary is described literally as a thing that appears, or is perceived or observed. In a more philosophical sense, the word takes on and extra layer of meaning – that of which the senses of the mind directly take note. This reiterates the importance of the researcher's mind as a measuring tool in this type of research. That phenomenological research is subjective can be honestly admitted. From this perspective, one could argue that all types of research, positivist or constructivist alike, have an element of subjectivity, despite the claims made otherwise by some researchers. A value-free science is neither possible nor desirable Aigen (1996a), p.10. Even the most 'objective' of scientists will tend to create their own data, not in a fabrication sense, but in the sense of selecting what is important. All my knowledge of the world, even my scientific knowledge, is gained from my own particular point of view, or from some experience of the world, without which the symbols of science would be meaningless. So it can be said that by recognising this fact and, in a homeopathic kind of way, treating like with like, the subjectivism may be transcended. 'Can anything be known that is not experienced?' asks Kinane. Can anything be conceived, or alluded to, that is not known, or of which there is no awareness? How we can understand carries emotional, intuitive and value-laden aspects which are influenced by previous experiences. Without reference to the context in which knowledge is generated, there can be no understanding Edwards, (1999). Forinash advises about the importance of articulating the researcher's own perspective in order to allow the reader to understand the preconceptions and influences the researcher might bring to the work Forinash (1995). Self-acknowledgement of potential biases and previous experiences (on the researcher's part) may also clarify the reflections and thought processes the researcher might make on the data. Husserl calls this process 'the interplay of experience and thought' Lauer (1965). Frequently returning to the original data and demonstrating how the results are well grounded in this data helps to strengthen the validity and accuracy of the work. Giorgi's conclusion is that far from being a contradiction, the project of establishing psychology as an empirical human science is distinctly feasible by grounding the data on phenomena that are given in experience Giorgi (1970). The data for this study was generated by two semi-guided interviews, one with the maker and one with the player, each lasting approximately one hour. The interviews were then transcribed into typed form from the tapes. I thoroughly familiarised myself with the material in the interviews by reading and rereading the transcripts. Significant statements and 'meaning units' were then extracted and collected in a new draft by using only the words spoken by the participants. The participants were invited to give feedback on the new draft at this point as a verification process. As themes began to emerge, they were identified and presented for discussion, in an attempt to make an exhaustive description of the phenomenon. The essences of meaning were distilled and conclusions are drawn in a final summary. It occurred to me that the essential tools for this study were very human and, therefore, unique in nature. The two interviews and my own reflections on them formed the basis for the distillation of themes. As qualitative researchers, we use ourselves as the research instrument Aigen (1996b). The small sample, i.e. one maker, one player, enabled me to obtain the rich, detailed material which is needed for qualitative research Amir (1996a). I was quite struck by the sensation of translating the material of the interviews from the aural medium to the visual, typed medium. I wouldn't like to buy it if it's just hacked out of the rain forest. If I found out that, say, the timber I was using was having a harmful effect on society, I would stop using it. He also mentioned the experience of working with different timbers and pointed out that his personal reaction to the smell or the dust from a particular one influenced the practical considerations of working with that timber. '[Mopane] wasn't agreeable for me to work it.' The properties of the timber had to be considered from a suitability point of view. You wouldn't use African Blackwood on the face of a guitar and you wouldn't use the pine that's used on the guitar for a flute, because it would, first of all, absorb moisture. After practical considerations, there followed concern for the appearance of the timber and the importance of a finish which would stand the wear and tear of use and serve to keep the timber alive. [Mopane] used to look bad in time. Most of the flutes I make don't have a finish on them. I put oil on them and I put shellac on them. Oil keeps the timber alive. [Other, harder finishes, may be] actually keeping the timber away from what can nourish it. The theme of life came across very powerfully at this point and throughout the entire process. The fact that timber was organic and constantly able to change, in good and sometimes bad ways, was recognised. However old a flute may be does not prevent it from responding to a changed environment by shrinking or cracking. The ability to respond, in other words, to be alive, seemed to be the most exciting thing about the use of a material which is 'made from living cells, so everything is, sort of, linked together like a structure.' The unpredictability of response was considered to be 'part of the fun of using natural materials.' The ability of the timber flute to improve with playing was found to be quite alluring. Being organic and from the countryside gives timber an added dimension. Not only does the idea bring with it a sense of place but it also carries a spiritual connection with the earth. [With instruments that are made] from things that grew naturally, there's a sense of the countryside, a sense of something natural. [The music] has a spirit or has a life, which came from the earth. I can tell the difference [between the sound of different timbers]. The differences I'm talking about will only be noticeable when a person is taking as much as can be taken from it [the flute]. It's something, isn't it? I love it. I think it's really beautiful. People shy away from it because it's expensive. What I like about cocus is, it seems to have the best of every world in it. Cocus is my favourite timber at the moment. The design of the body of the flute, the design of the bore of the flute, the design of the inside of the holes, the design of the blowhole, are all quite critical. If you have a well-made head joint, you will have a really good flute. The quality of the workmanship was always considered to be essential. With this particular instrument, both the quality of the woodworking and the key making were considered. If they [the keys] clack on the timber, that's the first deficiency of the instrument. Or if it [the key] leaks a very tiny bit, it'll give you a certain deficiency on the sound that comes from the instrument. They [the keys] must fit well and they must seat well and they must be quiet. I'm really pleased with the way it's shaping up. It looks like it came out really well. I feel sometimes that the instruments that come out of my workshop are really good. It's vitally important for me that other flute players come into my workshop and play and test all the time. I couldn't work on it unless I really felt right about it... because the piece of timber costs [so much]. I think if I had a set design from the day I started making flutes and was using it now, I would be in a mental home. I would not be able to live with it. There's no doubt about that, [feeling of connection to the instruments, which leave the workshop] especially if they're looked after. I saw one that was really abused. I felt that what I had invested in that instrument had been disrespected. The maker was also mindful of the special requests made by the player. One of the requests is that it's a light flute. The keys will be light because the material I use is 3mm silver wire. Most powerful of all was the image of the flute consuming the maker's very being. He identifies this power to consume from a player's point of view also, when he mentions that he feels the flute is the most physically demanding instrument to play, due to the demands on the breath of the player. I used up my resources, my eyes, I made myself tired doing it. I think if I didn't make flutes, I wouldn't have to wear glasses. It takes a lot of concentration. Hand in hand with this powerful notion is the need to have this personal loss, the personal investment respected. As the maker is connected to the instruments he makes, respect for the instrument also implies respect for the maker's work. Another remarkable comment on the power of the flute to do things, was the idea that the flute itself could indicate its own finishing point. Rather than bring a flute to the point of being "as good as it could ever be and [perhaps] beyond," the maker waits for the flute to indicate its own level. "It may be where that [the flute] is coming out." The social characteristics of the flute were recognised. "Flute players are attracted to each other." In part explanation of this fact, was the idea that, as the notes on the flute are very flexible, it caused the players to be particularly aurally aware of each other. I believe a flute is a very spiritual instrument. The breath is the bridge between the mind and the body. A flute player is always aware of their breath, even when they're not aware of their breath. You are putting what's keeping you alive into an instrument and by doing that you're making a sound. You have to be one hundred per cent with it for the flute because... the sound is coming from the pit of your stomach. There's nothing between you and the instrument. It actually becomes part of you. It never ceases to fascinate me. I'm amazed at this simple instrument. I'm amazed by what it can do. Foremost in the player's mind were concerns about the instrument. Throughout his interview, he held my flute (which is keyless and made from cocus wood by the same maker) in his hands. His immediate response to the instrument, both visual and practical, was enthusiastic and positive. It's very nice. It's very responsive. I really like that colour. It's nice and light. If it's like this, yeah, I think so [that I will really like it]. About as instantaneous as these positive reactions were his concerns about the possibility of the key work on the future flute diminishing the tone of the instrument or creating an irritating clicking sound. He hoped it would be easy to play and described how he had to work hard to get his other flutes to play as he wished. I'm expecting this flute to take me to another level. I'm expecting the instrument to allow me to play out of my skin, to make me a better flute player. He spoke about wanting a flute to suit him. He wanted to recreate the feeling when he got his first flute. He hoped the instrument would call him to play. He expressed his respect for the maker's ability. I know that playing the flute is affecting me, in a negative way, physically. I wouldn't have a pain between my shoulder blades if I didn't play the flute. He declared the flute to be his favourite instrument by far. He felt that at this stage of his life, he would like to concentrate on the essences of flute playing. He thought that sometimes he might not achieve his desired effect because "sometimes, you can be doing too much." I'd like to think only about flute playing and not effort now. When you're young, you have a lot more energy to dissipate and as you get older, you've got to be a lot more circumspect with the energy you've got and concentrate it into things you enjoy doing and not waste it. You've got to try and put your musical mind into a different drive. Go down the other road and see. You've got to be imaginative and try to put yourself in different shoes when you're trying to play good music. I mean, the instrument's completely connected to you, from the word go. You haven't got a reed, you've a blowhole. He acknowledged the power of the flute to affect his mood, in the sense of the instrument being "an extension of who you are," and offering him increased possibilities to amplify his feelings. If you're sad, and you can express it on the flute, it has to be good for your sanity, along the line. He identified two opposite poles in approaches to music: he lamented the way Irish traditional music is being relegated to smoky pubs and expressed a dislike for any kind of pretence with the music. He felt that the world of classical music was riddled with pretence and formality. He stressed honesty of intention as being of the utmost importance for him. If you're not sitting in a dingy bar in New Orleans, with about five people who think exactly the same as you do, that music isn't going out to catch anybody. At this point he was perhaps approaching the idea of the power of like-minded musicians to communicate non-verbally, not only with each other, but also with their listeners. He seemed to be concerned about the difficulty of maintaining one's independent point of view in the world of music as he could identify a lot of constant "media-blasting." He concluded his interview by expressing curiosity about the maker's feelings. "How does he feel about it so far?" he asked. If it be the case, as Moran (2002) argues, that the main contribution of phenomenology has been the manner in which it has steadfastly projected the subjective view of experience as a necessary part of any full understanding of the nature of knowledge, perhaps I could consider myself in a good position, as a flute player, to understand the experiences revealed in this study. We have to cope with people's lived experiences since a person's knowledge influences what he or she does Spaccozocchi (2001). What first became apparent from the content of the two interviews were the resonances within this dyad and the common ground they shared. Their entrainment of ideas included a preference for similar styles of playing, a desire for the same qualities and characteristics in the instrument, a desire to constantly learn and develop their skills, the idea that the flute demands one hundred per cent connection to the player, and a mutual admiration for one another's work. Perhaps significant is the order of themes which emerged for both participants. That the question of material was foremost on the maker's mind may not seem so unusual on reflection. The player's first concern was, of course, the instrument. The extra "ingredients" contained in the flute, apart from cocus and silver, could be identified as the positive energy the maker used while working, his very being which was consumed as he worked, and the depth of knowledge acquired from the continuous process of learning. Being a maker, teacher and player gives this craftsman many channels through which to gather information. Whether the player is aware of these intangible elements contained in the flute could be argued. It is likely that the player will appreciate the quality of the workmanship, the suitability of the materials and the experience the maker brings to his work. There is no doubt but that the standard of workmanship is affected by the response to the precious nature of the material. The overall phenomenological flavour of the project made an impression on me. The nature in which the initial idea for the study almost suggested itself to me, I found to be quite fascinating. The manner in which both participants began their interviews quite spontaneously, also pleasantly surprised me and enabled me to listen and discover what topics emerged as being most significant for each. I especially liked the player's phenomenological approach to flute playing when he expressed his desire to concentrate on the essences of flute playing at this stage of his career. The maker also had paradoxical, existential ideas in his philosophy of flute playing when he alluded to flute players always being "aware of their breath, even when they're not aware of their breath." From a music therapy point of view, the player had already discovered what is close to the heart of any music therapist. He felt that the manner in which he could express his feelings on his flute was good for his sanity and general well being. Perhaps the maker can be implicated in the therapeutic context here as he supplies the medium through which the emotions can be expressed and amplified. In summary, it could be said that all four "participants" in this study (i.e. the maker, the player, the researcher and the flute) had the same aims for their work. If the aim of research is as Kenny (1996) tells us, "to learn, to understand, to improve, to change and to grow," it seems as if all involved shared these desires. I include the flute at this point, as it seemed to take on a personality and become almost alive. Being made of organic material gives the wooden flute the power to become involved in the process of growth and change. A willingness to promote growth in one's life is an essential part of becoming a therapist, according to Corey (2001). The single, most lasting image which will remain with me from this study will be that of the flute powerfully consuming both maker and player, and demanding the very essence of what keeps them alive (i.e. their breath) to nourish its own life. Psychology as a Human Science: A Phenomenologically-based Approach. NY: Harper and Row Publishers Inc.
Edmund Husserl. Phenomenology and the Crises of Philosophy. NY and London: Harper and Row Publishers Inc.
Phenomenology of Perception. Translated from the French by Colin Smith. GB: Routledge & Kegan Paul Ltd.